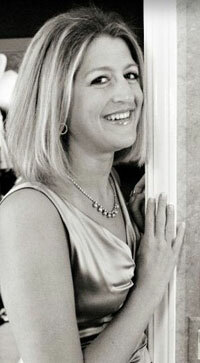 Testimonials about J. Scott Campbell Construction Company, Inc. Thanks for taking the time to show Larry and me around the Ashley jobsite. First, let me say I can see why you are proud of your team of craftsmen. From the foundation to the final paint finishes, the quality of your construction methods shows throughout. I can see that you do demand the best from your own crew, subcontractors, and suppliers. Your finishes are unique as well as the great design ideas you came up with to make the home open and fit the mountain landscape. I can honestly tell you that the craftsmanship all around your jobsite is second to none that I have ever been around. That does include O.L. Smathers and Don Crawford, who as you know, have always had the reputation for being some of the best builders in the area. The small things make such a big difference (vinyl tile in mech. room) and your attention to the details is everywhere. I am glad and proud that you allowed Larry and our company to participate in the project. I sincerely hope we will be a part of your future projects, and I am 100% certain that you and your team are more than capable of building homes in the Balsam Preserve. The quality of your work would compete with any builder that I know. I am sure the Ashleys will be as impressed with their new home as I am! 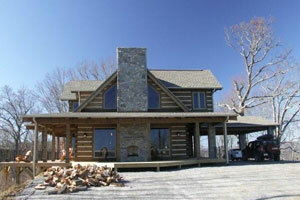 When we were beginning to build our dream home log house, we encountered a problem with the contractor we had hired. We were at a loss to know where to find a contractor as we were new in this area. We were given Mr. Campbell's name and he agreed to give us an estimate. He told us he wasn't the cheapest contractor but that he would build us a solid house. We can't say enough how relieved we were, as we felt we were in good hands. We have lived in this house now for 20 years and love every minute of it. If you need an honest contractor, a careful one who treats you as if it were his own house he is building, Scott Campbell is the right man. Thank you from the bottom of our hearts for doing such a splendid job. 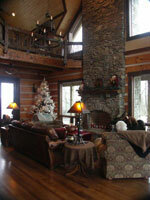 Scott and his team took our requests and turned them into a log home more beautiful than we could have imagined. We especially appreciate his incorporating our rustic barn from Kentucky into the interior trim pieces. David (Scott's foreman on our project) even had some fantastic ideas on how to use the tin from the barn to add character in places like bathrooms, hallways, and dormers. Earlene's Dad would have been so proud to have seen the "old tobacco barn" come back to life inside our home. When we began to consider building a house in the mountains we knew we would need a builder we could trust, especially because we could not be on site often. Campbell Construction proved to be a great choice! Scott's years of experience, vision, attention to detail and commitment to fine craftsmanship produced a home that exceeded our expectations. Throughout the process Scott and Janice cared for the project as if it were their own and gave us not only a mountain home we love but a friendship we treasure. It’s an honor and pleasure for me to write a testimonial for Campbell Construction and it’s owners Scott and Janice Campbell. My husband and I met Scott Campbell several years ago and knew immediately that he was someone we could trust and would like to get to know better. Scott’s passion for the North Carolina mountains, it’s rich history, it’s hospitality and it’s way of life are felt instantly. As we have gotten to know him better over the years, we have been blessed by his great talent with architectural design and building. His homes are completely unique and handcrafted with the utmost care and pride. He is a true artist, as seen through his work. 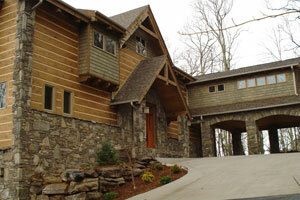 Scott not only realized our dream home but has far exceeded our expectations. After working with Scott for years now, he has proven his trustworthiness and has completed our beautiful log home in a timely manner. He always pays close attention to quality and details. All of the people involved with Campbell Construction, (clients, contractors or employees) are very important to Scott and all are treated fairly and with respect. He takes a sincere interest in all the people that are around him. We are privileged to be a part of that group. 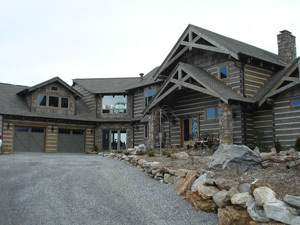 All of his crew have unique and individual gifts that Scott co-ordinates to build exclusive and rustic homes that accentuates the individual attributes and beauty of each lot. We began the process by working with Scott’s architect. 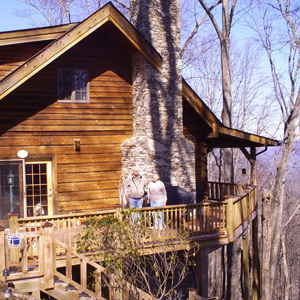 She listened closely to our desires and worked hard to meet those goals, while utilizing the distinct characteristics of our lot, to design the perfect log home for us. As the house was being built, several changes were made in appreciation of the natural influences of our lot and location. We are very grateful to have chosen a builder who is able to think “outside of the box”. Scott’s high standards are evident in all of his homes. His attention to the details and creative ideas are part of who he is. We would highly recommend Campbell Construction to anyone who asked. My Father is a strong man. His strength emanates from the force of his will, the power of his stride, the determination of his gaze, and the undeniable respect his presence demands. He expects a certain level of excellency in his work, in his relationships, in his life as a whole…and he never expects anything more from anyone than he expects from himself. Those that know him respect him, but they can’t help but love him as well. At first glance he may seem hard, but he is the most giving and kind man I know. He’d give his last penny to another man if he needed it, so sure is he in his capability to persevere despite life’s obstacles. Coming from a family of Ivy League Graduates and Social Figures, my father took a different path. After receiving a scholarship for swimming in college he decided to follow his passion instead, despite the discouraging lack of support from those around him. He moved to NC from Miami, Fl and began to build the family construction business with my mother by his side, in a small mountain town that was wary of outsiders. Despite many obstacles, his craft has seen a definitive progression over the last 28 years. His projects have changed so that practical housing and sound carpentry of the early years has evolved into an art form, a mastery of shape and form, light and space, that will capture the heart and make those who have the privilege of viewing his work remember what it’s like to truly see again. His talent is undeniable, but it his hard work and determination that truly inspire. His perfectionist tendencies radiate throughout each piece of art in a way that flows effortlessly rather than stiffly as one may expect. He is a visionary, an example, a role model, and a light in the life of many. He is my father, and I am unimaginably proud to say so. Do you have a great experience with Campbell Construction to share? Go to Google or Yahoo (your preference) to let other people know! Thank you! We appreciate it! Copyright © 2009-2010 J. Scott Campbell Construction, Inc. All Rights Reserved.